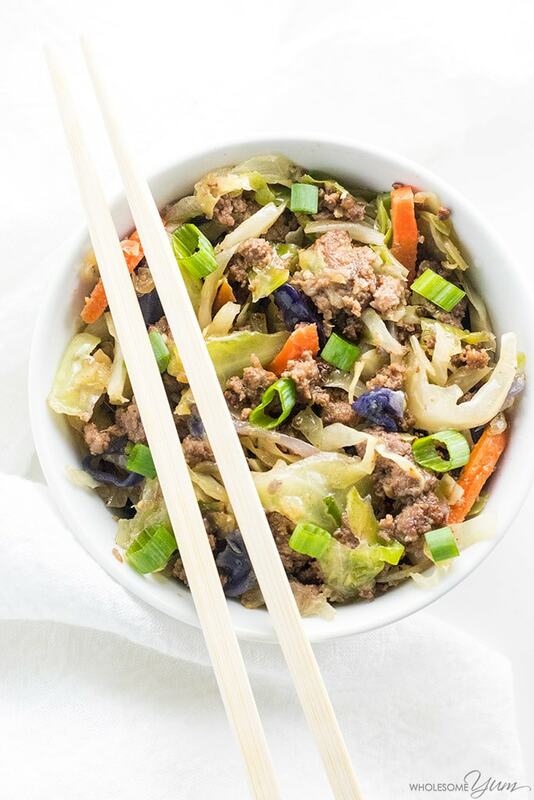 For the fastest, easiest keto paleo dinner, try this crack slaw egg roll in a bowl recipe. It's made with common ingredients and takes just 15 minutes! It’s been a couple of weeks since we returned from vacation, and I’m still relishing the switch from bland food to flavorful spices. Right now, I can’t get enough of this low carb crack slaw recipe, also known as paleo egg roll in a bowl! This is just about the easiest healthy dinner ever. You can have it on the table in just fifteen minutes. It’s a one-pan meal, too. What is Crack Slaw or Egg Roll in a Bowl? If you haven’t heard of crack slaw or egg roll in a bowl before, it’s basically just a stir fry with beef and cabbage. It reminds me a bit of my favorite chicken cabbage stir fry recipe. It’s no secret that stir fry recipes are my favorite. They were the beginning of my healthy cooking journey, and so they are near and dear to my heart. Besides, what better way to use up random veggies you have than a good stir fry? But this one… oh my goodness, you guys. It’s so, so good… I think it’s my favorite of them all! And it’s surprisingly addictive, hence the name “crack slaw”. It’s almost hard to believe that something so good for you can taste this delicious. And that’s exactly why I’m excited to share it with you. You may already be familiar with an easy crack slaw recipe like this and not even know it. It often goes under another name, egg roll in a bowl. This alternative name is perhaps more intuitive, since it’s exactly how it sounds. This dish is just like an egg roll, without the wrapper. 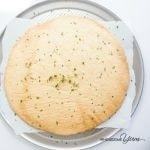 Many paleo or low carb swaps for traditional high carb foods require grain-free or low carb dough, like fathead pizza or keto bread. And yes, I do love these. 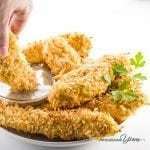 They are even the most popular recipes on this site. Gluten-free bread-like replacements are delicious and certainly healthier than their wheat counterparts. But, they should not be the entire basis for a low carb diet. In my eyes, the whole point of a low carb diet is to focus on real food. Unprocessed meat and vegetables should be your staples. 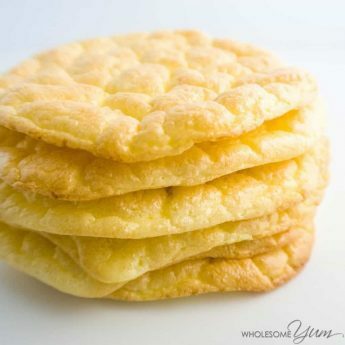 They are the healthiest aspects go going grain-free, low carb, or paleo. That is where you will get the highest nutritional value. And this is why I love keto crack slaw so much. It’s the ultimate low carb, paleo, and whole 30 meal. The best part is, it’s naturally that way. It’s not contrived. You don’t need any specialty ingredients, and it skips the heaviness of nuts and dairy. It even works for almost any diet (except vegetarian, of course). 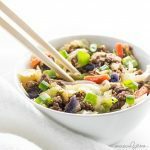 In addition to keto, low carb, paleo, and gluten-free ways of eating, an egg roll in a bowl is also perfect for Trim Healthy Mama, 21 Day Fix, Weight Watchers, and the Whole 30. Oh, and did I say it’s absolutely delicious? 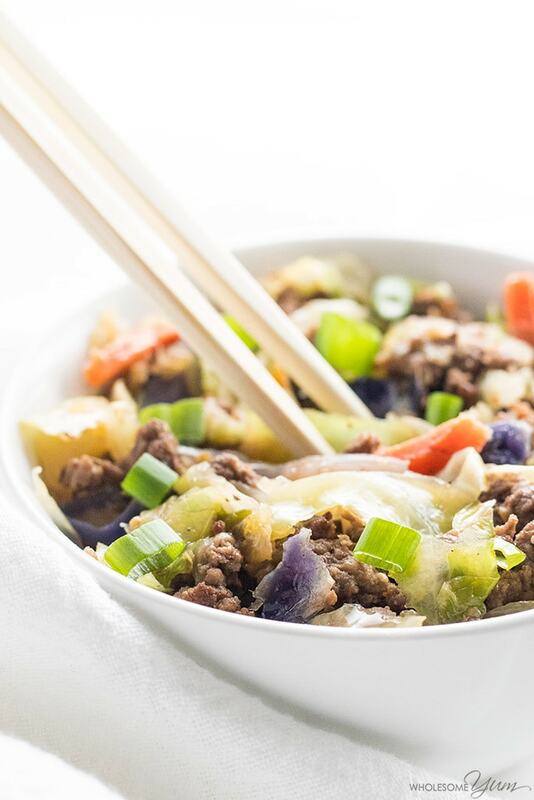 This egg roll in a bowl is Chinese food (or at least Chinese American food) at its finest – and healthiest, not to mention easiest. Forget the cornstarch, flour roux, sugar, and rice that are all often found in Asian dishes. You don’t need these! The ingredients for crack slaw are common and simple. They also store well, which is wonderful if you like to meal plan on a weekly basis. You can schedule this easy low carb cabbage stir fry for dinner at the end of your week. All the ingredients will still be fresh enough to make it by then. To start, saute the garlic and fresh ginger in some avocado oil, until fragrant. I chose avocado oil for its neutral taste and benefits, but any oil or even butter will do just fine. There is some flexibility in terms of the ginger, too. Feel free to use fresh or ground as you see fit. I like to use fresh ingredients when I can. But, in the case of ginger, the ground version is actually a lot more potent. You can definitely use that instead of fresh if you really like a concentrated ginger flavor. Or, just use even more of the fresh kind! The recipe is not fussy. Next comes the meat. I opted to make my keto crack slaw with ground beef. Any kind of ground meat will do! It’s not uncommon to see egg roll in a bowl made with pork or chicken. You could even use ground turkey. Saute your ground beef, or whatever meat you are using, along with the garlic, ginger, sea salt, and black pepper. Use medium-high heat, so that you get some nice browning. Once the meat is cooked, add the main ingredient – cabbage! Reduce the heat and toss the cabbage with some coconut aminos. Stir fry it for about five minutes, until the cabbage is nice and tender. If you are looking to save money, or if you don’t want the carrots found in coleslaw mix, a head of cabbage is just fine. Just chop it up and toss it in. You need about four cups, either way. At this point, the cooking part is done. Turn off the heat and stir in the toasted sesame oil. You definitely want to do this last, only after removing from heat. Don’t cook with the sesame oil! The reason is that toasted sesame oil has a very low smoke point, and will release carcinogens if you cook with it at high heat. We don’t want that! Toss your everything with some fresh sliced green onions, and you’re good to go. You can even throw in some sesame seeds, if you’re so inclined. So, are you ready to make some yet? Once you’ve made an egg roll in a bowl, I can almost guarantee you’ll be making it again and again. It’s one of my favorite low carb dinners for busy nights. Heat avocado oil in a large saute pan over medium-high heat. Add garlic and ginger. Saute for about a minute, until fragrant. Add ground beef. Season with sea salt and black pepper. Cook until browned, about 7-10 minutes. Reduce heat to medium. Add the coleslaw mix and coconut aminos. Stir to coat. Cover and cook for about 5 minutes, until the cabbage is tender. Remove from heat. Stir in the toasted sesame oil and green onions. Click or tap on the image below to play the video. It's the easiest way to learn how to make Crack Slaw! Made this for first time tonight. It was easy and very tasty. My entire family loved it. I see why they call it crack! Just made this. Delicious! Don’t have any Coconut aminos so added some MCT Oil after it was cooked. Probably not as flavorful but loved it! A definite do over and very nourishing. Thank you Maya! 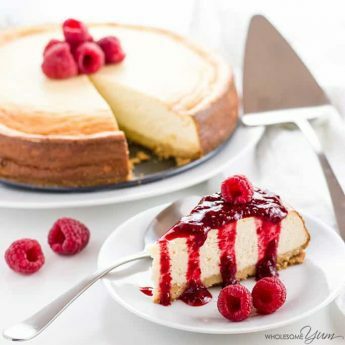 Love your site and your recipes! Want to try this one. Can I use MCT Oil at the end instead of the Coconut Amino as I don’t have any? Thank you! Hi Shelley, Thank you so much! Technically you could but it wouldn’t be similar at all. Coconut aminos is a replacement for soy sauce, not for an oil such as MCT oil. Oh my goodness this recipe is amazing! I’ve tried a few other versions of crack slaw/egg roll ina bowl and this one is the easiest and the best! Perfect comfort food for the hideous snow storm out my window! Can you freeze the leftovers, if only 1 person eating? Wonderful recipe. Hi Donna, Yes, you can. You might need to freshen it up with a bit more coconut aminos and/or oil when reheating if it’s dry. Is there a substitute for coconut aminos? Hi Susan, Soy sauce also works, but I always recommend coconut aminos over that due to soy’s estrogenic effects. I just made this for lunch, wow it is delicious! I followed the recipe exactly and it turned out amazing. I topped mine with a fried egg and sliced avocado. It reminds me a lot of a rice bowl I used to love to get at a local restaurant, just the low carb version. I will be making this again for sure, don’t think I’d change a thing. Thanks for sharing the recipe! I am so happy to hear that, Tanya! Have a great day! 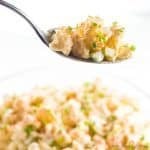 Crackslaw is awesome and we love adding a fried egg on top! OR some slices of avocado. Thank you, Jan! Eggs and avocado on top sound delicious. 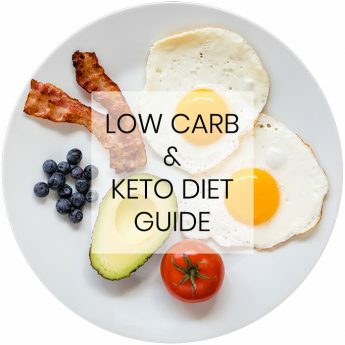 I got onto Keto this month and your site has been my go-to for everything, I really appreciate all the recipes and information on this diet! Do you think this slaw would hold up over the week? I thought about making it for this weeks lunches. Maybe I can add the green onion after re-heating and everything else will do ok? Since I’m single, I always have leftovers. I am so happy you liked it, Leslie! Yes, this will last several days in the refrigerator. Have a nice day! I made the Crack Slaw tonight and it is amazing! I served it on a cauliflower pizza crust. It was fantastic!! Quick, easy and nom nom!! Thank you, June! Sounds like a yummy dinner. How many carbs per serving ? I didn’t see a nutritional breakdown. Thanks! There are 4 net carbs in 1 cup serving. Thanks for stopping by, Michael! SOOOO FAST and EASY! I added crushed red pepper, juice of half a lime and substituted Tamari for the coconut aminos and garnished with black sesame seeds, cilantro and diced cucumber. If you have a left over protein that is already cooked this is a 7 minute recipe! I had a blueberry muffin for dessert. Thanks Maya! Thank you, Pat! Those adjustments sound amazing. How about (GF) Tamari instead of coconut aminos? Hi Patrick, I prefer not to eat soy but otherwise it’s totally fine to use here. You can replace the aminos with the same amount of tamari. What do you use if you don’t have coconut aminos? How much? Hi Nicole! You can use soy sauce if you’d like, preferably a gmo-free, organic one. Thank you! Hi Maya! 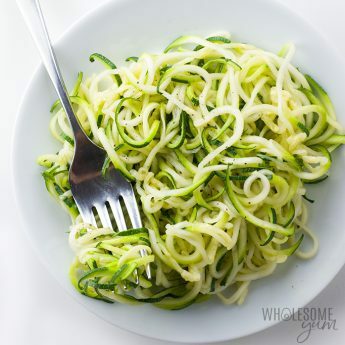 I found this amazing recipe as I was watching a woman on you tube talk about her venture into the keto lifestyle. In her video she mentions ‘crack slaw’ and how that recipe got her motivated. I had NO IDEA what she was saying, until I did a search, and your recipe turned up amidst many others. I, of course, clicked on yours…the rest is history! This is my ‘go-to’ weekly! 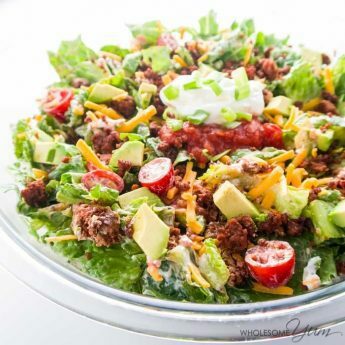 Thank you for your dedication as it enables me to head down the same road so many people are headed down…Yours is the best for keto, and low carb, high fat delicious recipes! muah! I’m that grateful! I am so happy you liked it, Jacque! Thank you for stopping by! My entire family enjoyed this last night with a broccoli slaw instead of coleslaw as that’s all I could find at the grocery store. They had it with basmati rice and I had it alone. I can see this in regular rotation! Thank you!!! Hi Cindy! I am so happy your whole family enjoyed the slaw! Have a nice day! I am not following any particular diet, just trying to stay away from processed foods and eat fresh food in moderation. I saw this recipe and just had to try it-so delicious! It was a big hit with everyone, this one is a keeper. Hi Susan! I am so happy you liked it! Thank you! Can’t wait to make this for dinner tonight. Just wondering – how come the recipe calls for avocado oil (vs. say coconut or olive oil)? There are tons of contradicting ideas out there that claim one oil is better than the other. Do you have a reasoning for one vs. the other? Thanks! Hi Brittany, There are some oils I avoid, but the main ones I use are all the ones you mentioned – avocado, coconut and olive oil. The reason I chose avocado oil for this recipe is because it has a neutral taste and very high smoke point (500 degrees). Olive oil has a lower smoke point. Coconut oil does as well, though it’s higher if you have refined coconut oil. Any of these oils will work fine in the recipe, avocado oil is just my preference. Looking for saturated fat info or freestyle points information for WW. This looks amazing!!! Thanks! Thank you, Cindy! 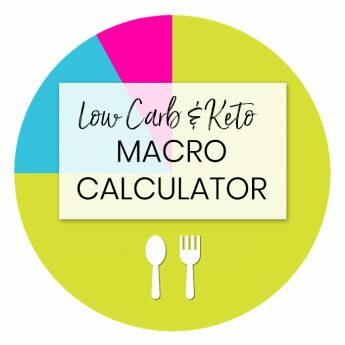 The only information I currently have is on the recipe card, but you can enter the ingredients you’re using into an online calculator to get the rest. I hope you’ll try this dish! Thanks, Maya! I’ll try that now! I’m new to the program and am still figuring out the tools. With a substitution of ground turkey for the beef and soy sauce since I don’t have access to coconut aminos, it appears that this recipe is worth 1 freestyle point per cup on WW. I’m trying it tonight. My entire family enjoyed this tonight with a broccoli slaw instead of coleslaw as that’s all I could find at the grocery store. They had it with basmati rice and I had it alone. I can see this in regular rotation! Thank you!!! I love that, Cindy! Thanks for stopping by! Thank you, Debbie! That means a lot! Hi Debbie, I’m reading your post and realise your words said basically the same thing I want to say! Isn’t this the absolute best recipe ever?!? It is at my house, and my husband who was a ‘meat n potato’ kinda guy, asks for this weekly! I absolutely love to hear that, Jacque! Thank you so much! Love this recipe! I had a leftover boneless chicken breast substituted for the ground beef. With the chicken sliced very thin, it cooked a tad quicker than ground beef. I also added a small can of mushrooms. Since I live alone, being able to change the portions to adjust the ingredients is very helpful. This is definitely a do-again recipe! I am totally on a mushroom kick right now, thanks for the tip! This is the reason I enjoy reading comments, it’s nice to hear what others have tried! Hi Maya, this looks awesome, but I can’t find coconut aminos anywhere (I’m in Australia). Granted, I haven’t tried any specialty shops yet, just my regular supermarkets, but what is it like and is there something that would make an acceptable substitute? Hi Rachel, I buy coconut aminos on Amazon here but not sure if that would ship to you or not. Whole Foods also carries it – I checked and it looks like that store exists in Australia? Otherwise, coconut aminos is similar in taste and consistency to soy sauce, so if you are ok with that, that would be a substitute. Do you know, I never knew that we had Whole Foods here, but I just Googled and you’re right! Worth checking out, thank you! You can buy coconut aminos at health food shops in West Aust. But go on line and look for recipes to make you own paleo soy sauce.